Slim, powerful and beautiful, Yotaphone 2 combines Android familiarity with something that has never been accomplished before: two fully touch-enabled displays with two very different personalities. Wednesday 3rd December 2014, 6pm GMT. LONDON — We at Yota Devices, the mobile start-up behind the world’s first “two-fronts” smartphone, are proud to launch the highly anticipated Yotaphone 2. The front display is a high-definition 1080p AMOLED screen, perfect for everyday use such as social networking, browsing, watching videos or playing games. Turn the phone around and you’ll see the other front screen, which uses a Yota Always-On Display that is ideal for e-reading, notifications, outdoor visibility and much more. “We believe our technology constitutes an entirely new species of mobile device, not just by integrating a power efficient electronic paper display but by making two screens work in harmony,” said Yota CEO, Vlad Martynov. The Yota Always-On Display can drastically improve battery life, offering up to five days of e-book reading from a single charge. Ordinary Android phones also have power-saving modes, but Yotaphone 2 lasts up to three times longer based on usage that involves reading, messaging and calling. Reading on the Yota Always-On Display is up to 7x more power efficient than on the AMOLED HD screen. The Yota Always-On Display offers almost 180 degree viewing angles and excellent readability even in direct sunlight, making it easy to see and use any Android app while you’re outdoors. The Yota Always-On Display offers an “at-a-glance” view of what’s happening in your personal world, removing the need to constantly pick up, turn on and navigate to your emails, social networks or text messages. Just like a wristwatch, all you have to do is look and everything you need is available at first glance. YotaPhone 2 is the product of an international team of engineers who have the passion and talent to create something that has never been built before. It has taken three years to get to this point, but Yota is now in a position to offer consumers real choice, rather than just another slightly different iteration of what is already available on the market. Yotaphone 2 is lightweight at only 145 grams. It’s also very slim (144 x 69.5 mm x 8.9 mm) and, with durable Gorilla Glass 3 on both sides, it is far from fragile. It’s a mobile device that is both useful and elegant. YotaEnergy — This modeautomatically switches all key functions, including calls and texts, to the Yota Always-On Display once battery life reaches 15%, providing another 8.5 hours of use. 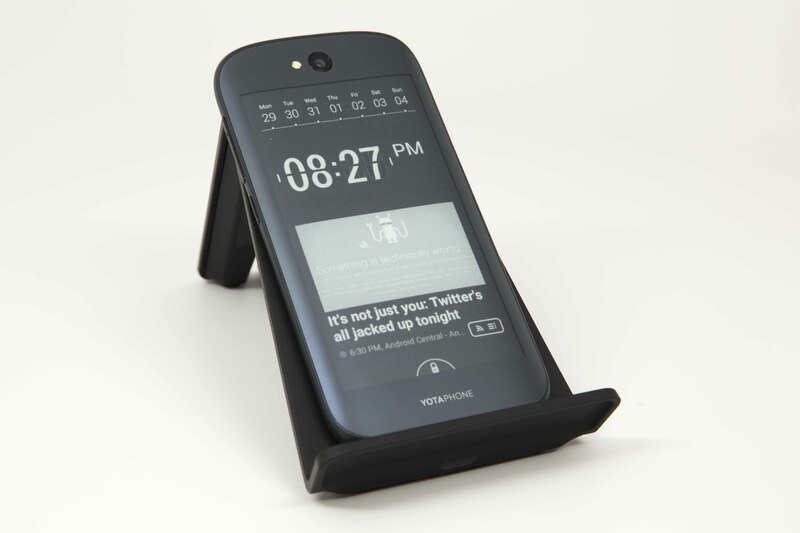 YotaMirror — You can use any Android application on the Yota Always-On Display. This includes everything from the most popular e-reading apps (such as Amazon Kindle) right through to messaging apps (like WhatsApp), music streaming apps (like Spotify) and any other activity that could benefit from superior battery life and readability. YotaSnap and “Life after death” — Grab a crucial bit of information from the colour display — such as a map, meeting location, or the QR code from a travel ticket — and preserve it on your Yota Always-On Display. What’s more, you can hold this information on the screen even if your battery dies completely. YotaCover — Make your Yota Always-On Display private with a single tap. YotaCovers are user-designed photos and notifications that bring beauty and personalisation to your device without giving anything away to onlookers. All of this is accomplished on the “rear” side of the device — an area that has long been dismissed as useless space on ordinary smartphones. An 8MP autofocus camera with LED flash (which can be used to take high-res “selfies” thanks to YotaMirror) and a front-facing 2MP camera. YotaPhone 2 costs 555 GBP in the UK and in the region of 700 EUROS elsewhere in Europe. It is now on sale in 20 countries in Europe, the CIS and Middle East, from www.yotaphone.com and a variety of channel partners. The first Yotaphone Store opens in London (off Brick Lane in Shoreditch) on Wednesday 3rd December at 6.30pm. YotaPhone 2 will be available in Hong Kong by the end of December this year and Taiwan in Q1 2015. Availability for China and additional Asian markets will also begin in Q1 2015 with USA, Canada & Latin America availability coming soon after.